(Francisco Kjolseth | The Salt Lake Tribune) Receiver Britain Covey, #17, runs through drills as the Utah football team takes to the practice field for day one of the season on Wed. Aug. 1, 2018. 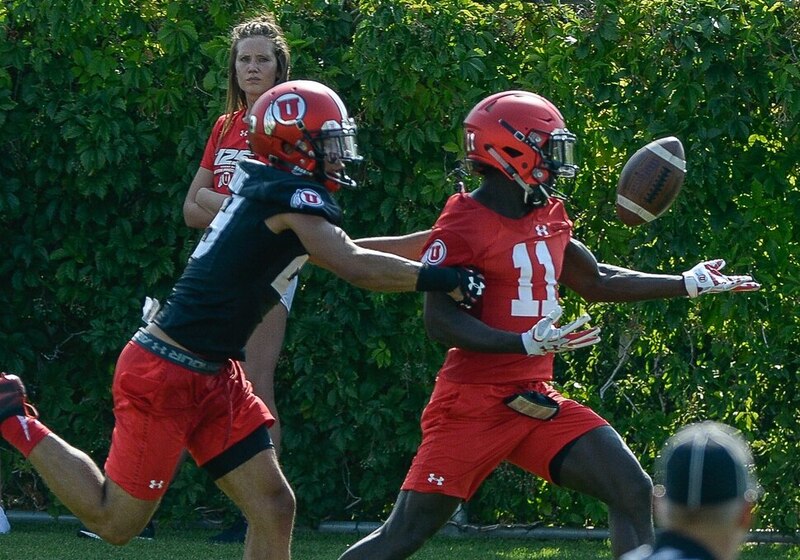 (Francisco Kjolseth | The Salt Lake Tribune) Wide receiver Terrell Perriman, #11, tries to pull in a pass as the Utah football team takes to the practice field for day one of the season on Wed. Aug. 1, 2018. 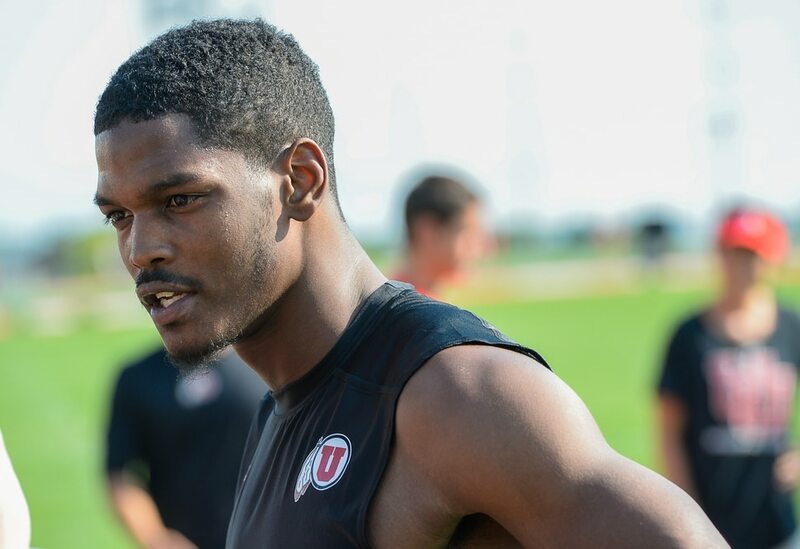 (Francisco Kjolseth | The Salt Lake Tribune) Safety Marquise Blair, #13, is interviewed by sports reporters following the Utah football team's first practice of the season on Wed. Aug. 1, 2018. (Francisco Kjolseth | The Salt Lake Tribune) Receiver Derrick Vickers, #17, is interviewed by sports reporters following the Utah football team's first practice of the season on Wed. Aug. 1, 2018. (Francisco Kjolseth | The Salt Lake Tribune) Wide receiver Batchlor Johnson runs through drills as the Utah football team takes to the practice field for day one of the season on Wed. Aug. 1, 2018. (Francisco Kjolseth | The Salt Lake Tribune) Receiver Britain Covey, #18, tries to clear his cover from Tareke Lewis, #5, as the Utah football team takes to the practice field for day one of the season on Wed. Aug. 1, 2018. (Francisco Kjolseth | The Salt Lake Tribune) Offensive coordinator Troy Taylor works his arm and his players as the Utah football team takes to the practice field for day one of the season on Wed. Aug. 1, 2018. (Francisco Kjolseth | The Salt Lake Tribune) Receiver Derrick Vickers, #17, runs the ball as the Utah football team takes to the practice field for day one of the season on Wed. Aug. 1, 2018. Well, not yet. But Utah fans won’t have to wait too long to see No. 13 stalking and waiting to launch himself. Pads come on Friday. Then Marquise Blair will be comfy again. 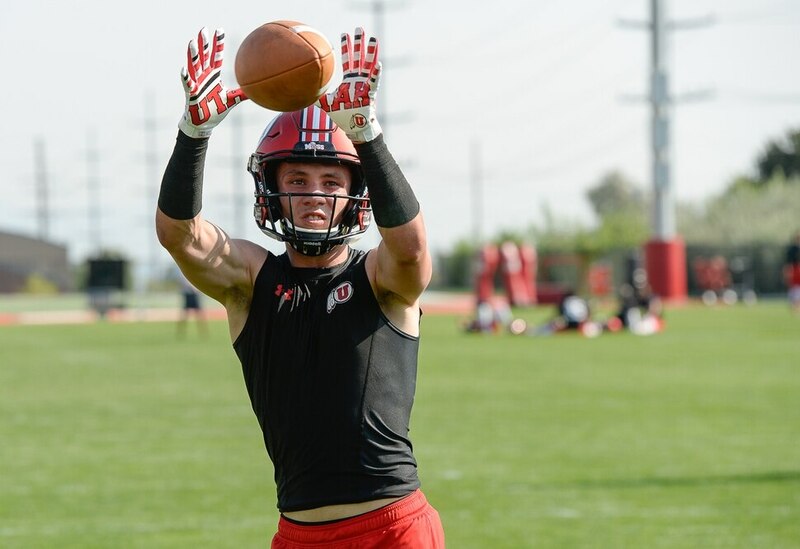 It’s been nine months since the now-senior strong safety went down awkwardly on the turf inside Rice-Eccles Stadium, suddenly halting a stellar junior year in which the one-time JC transfer became a fixture of Utah’s defense. The knee injury suffered in a runaway win against UCLA last November turned out to be a significant blemish on what would’ve been an otherwise perfect evening. Blair recalls hoping it wasn’t serious, but when he couldn’t stand up on his own, he knew it was. The 6-foot-2, 195-pound big-hitter underwent knee surgery in high school, so he knew what he was up against. Monotonous days without the sport that he loved. Pushing himself to the limit in rehab, and then having to tone it down. A former JC All-American at Dodge City CC, Blair became a household name in the Pac-12 Conference in 2017 known for his painful open-field hits. Blair played in nine games a year ago, starting six, and lined up all over the field, including stints at strong safety, free safety and even at outside linebacker. He finished the year with 48 tackles. It’s actually been a couple of months now in which Blair has felt 100 percent. Once he got to that point, he started perfecting his footwork and has started adjusting to lower his tackling angles once more. Those were things, he said, that were already on the improvement list regardless of the injury. When asked what adjective he’d use to describe Blair on the field, defensive coordinator Morgan Scalley didn’t blink. Is there any trepidation that it might take some time for Blair to get back to his highlight-hitting ways? Because he wants the real thing. It’s a different Blair in 2018. A year ago, as his star began to soar, he was a bit apprehensive when approached for interviews, jokingly trying to evade the Utah sports information staff because he was uncomfortable. On Wednesday, the senior stood tall and spoke about getting through the pain of being sidelined. To Scalley, Blair’s matured plenty ahead of his final year at Utah. He recently became the father of a baby boy, too. Blair said while most would go a little stir crazy in the absence of such a familiar routine, he didn’t. Scalley said Blair, in fact, returned earlier than expected. So once he felt 100 percent, that was that. “Wish I had him for a few more years,” Scalley said.